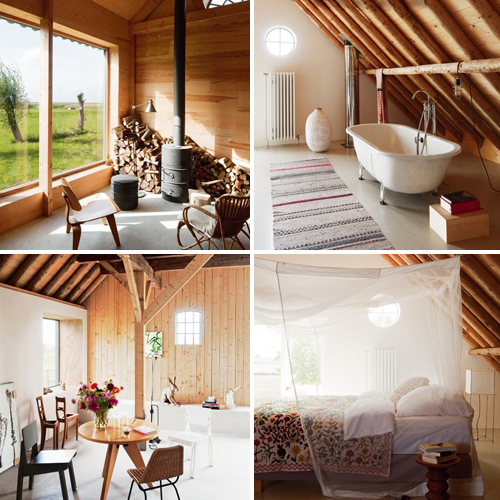 This neglected barn in The Netherlands has been beautifully renovated by Ina and Matthijs van Meijet Cruijsen. The living room (top image), as well as the rest of the house, is a great balance of rustic and contemporary. The large window offers a magnificent view over the Dutch countryside. 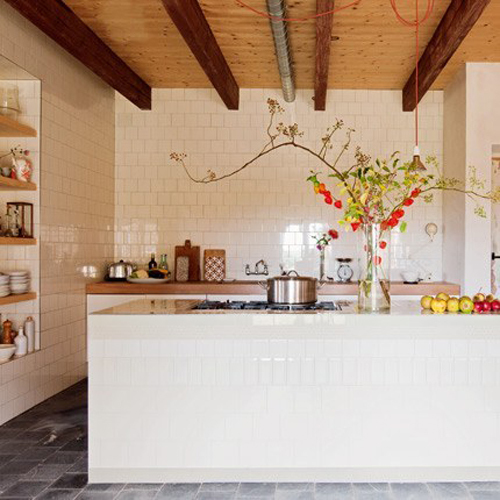 The combination of a modern lifestyle is reflected in the rustic ambiance of the house, especially in the kitchen (image below). Various materials and styles blend together in both rustic and contemporary. The bathroom (top right image) is located in the area were once hay was stored. love that mix of rustic and modern style!! Wow. I love this one. Look at that bed. Beautiful. Love the kitchen! And I love this blog – I’m a new reader in the U.S., and I love what you choose to feature. Look forward to seeing more! that kitchen is to die for… amazing house! I love the mix of natural wood and white! So clean and modern even though it is a rustic look. A lot of our new light fixtures are the same natural wood look, but not sure how long it may last! love the open beam ceiling and the moroccan kilims. Love it! It’s very airy yet cozy! Great style! Love the renovated barn! The rustic barn takes the cold edge off the modern decorating…great combination.